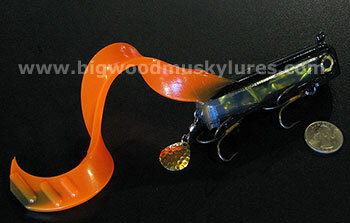 Description: Double Flash Twinkiee's are in and exclusively available at Big Wood Musky Lures! The new, Rubber Hairy Tackle Double Flash Twinkiee's have a flashy foil center and trailing blade for additional flash and vibration. Double Flash Twinkiee swimbaits from RubberHairy Tackle are a hand poured Musky bait made with a mix of durable saltwater plasctics. Made entirely in the U.S., the RubberHairy Tackle Twinkiee has a unique tail action unlike any other Musky Swimbait. The Twinkiee tail is ribbed for extra pleasure; it thumps and displaces water, triggering the lateral lines of predator fish everywhere. The smaller 4" size (body measurement only) Twinkiee weighs in at about 3 oz. and measures about 9 1/2" with the tail pulled back straight. Muskies love to eat Twinkiees. Get your Double Flash Twinkiee's exclusively at Big Wood Musky Lures!